Fantastic holiday.Iwould be hard pressed to fault this hotel.extremeley clean,with bed linen changed daily.food was of good standard with plenty of choice.The hotel is a couple of miles from the bustling town of Tsilivi which is a pleasant 30 minute stroll down hill to,or a 7euro taxi ride.although technically the hotel is not directly above a beach, it is within a 100 yards.The staff can't do enough for you and are always smartly dressed.Now personally i don't go on an all inclusive holiday worying about the entertainment,in fact it's a standing joke,but in all honesty they were excellent.There is ample games to occupy the children during the day aswell.Now what are the faults........sorry but i really can't think of any.! We stayed in the Louis Plagos Beach hotel in Trajacki at the beginning of June. The hotel was very clean and the staff were very friendly. The view from the hotel is absoloutley fantastic. There is a gardener on the job all day keeping the grounds spotless. The flowers decorating the resort add to the feeling of being in paradise. The food was pleantiful and loads of different choices catering for all tastes. The entertainment for the children was fantastic thanks to the animation team. The team also have various activities during the day to keep all entertained. A very pleasurable holiday and a beautiful hotel. Many thanks to all at the hotel for your wonderful hospitality and for helping me to have a wonderful experience. For a supposidly good hotel the lack of attention to detail was amazing. Rooms were supposidly refubished but there were broken tiles, the bathroom door was so warped it would not shut. The television never did work despite many complaints. The food was good but it was served indoors in a barn of a restaurant instead of the pleasant evening air. With hundreds of people in there it was always noisy and people got there early just to get a table. Entertainment team did there best and were enthusiastic but frankly it was poor. If your standards are not that high and you are a Chav from Essex this is the hotel for you. 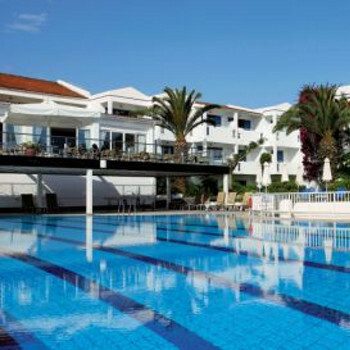 Spent the first week of June at the Plagos and found it to be very good.All of the staff were friendly and helpfull at all times and made us feel at home straight away.All areas of the hotel were well maintained,very clean and well laid out. The food was excellent with more than enough choice for all tastes at breakfast and the evening meal.Not such a big selection for lunch but still more than made up for with freshness and quality. The hotel is slightly out of the way and has limited on site entertainment which makes for a very relaxed peacefull atmosphere but will not suit those looking for a lively resort. Although the hotel is on the sea front there is no beach - just access to a bathing platform for swimming. However there is ample space around the pool and gardens for sunbathing and a small beach is only 100 metres away. The hotel was absolutly amazing. On entry to the hotel we were greeted extremely warmly. There was a slight confusion as there was 14 of us and there was also another large group under the same name. This however was sorted out very quickly with many apologies. On inspection of the rooms (sea view) they were extremely clean. the bed linen and towels were changed daily. There were few children as it was the beginning of the season, the children that were there were looked after by the entertainment team and we more or less didn't see them. The food was very fresh and there was definitely plenty to go around. The only concern was the air conditioning was not on during Dinner time as it apparanlty dried out the food. Also the men had to wear long trousers during dinner which we were not informed of by our travel agents. The location of the hotel left much to be desired. However we were only a short taxi ride away from Tsilivi (7 euros). the resort itself is in the process of being built up, but not to worry there ar no building sites any where near the hotel. The staff could not do enough for us and we were supplied with bottles of water whenever we wanted. And packed lunches were provided when we wanted them. The entertainment left much to be desired. although they kept the children occupied during the day they offered little entertainment for ourselves for the evening. The only good thing they did include the adults in was water polo, every day at 3pm. This was water polo with no rules, hence we all came away rather flushed and bearing a few war scars. We have just returned from the Plagos Beach hotel in Zante, I am 42 my wife is 41 and our daughter is 21. We have visited many AI hotels in the past but were very very pleased with this one, the staff can not do enough for you, the food was fine freshly cooked and a good variation. Lunch in the pool bar was nice and gave us a chance to cool off. The weather was perfect we were a little concerned going at the end of August as we normally go a few weeks earlier, however it was still right up there with 30 degrees being hit most days. We did have an electrical storm one night but this just added to the adventure the hotel got struck by a bolt of lightning taking a nice chunk out of one of the buildings. The nearest proper shops are just down the road in Tsilivi (7 Euro in a taxi/ rollercoaster ride) and well worth a few visits. Zante town is only 10 Euros in a taxi so no major problems there. We took an all day boat ride around the Island this cost 20 Euro booked from one of the little booking offices at the harbour or 32 from your rep (you do the math)well worth doing but is draining, you get to stop a few times for a swim but the best is at the smugglers cove this has to be seen to be appreciated and no visit to Zante is complete until this has been done. I would recommend this hotel to older families especially at this time of year and once you hit September there are no or very few kids and it is just relax time. I have not visited enough places on this earth yet so may not return for a few years but due to the commitment of the staff I will be looking to book another Iberostar hotel for next year. The Plagos Beach is dominated by people on all inclusive and was mainly English visitors and some Swiss. The entertainment staff are the hardest working I have ever seen but the shows by this mainly Italian team at night were a bit slapstik for our tastes. Better entertainment was to be had at the nearby Heaven bar, with a young English girl singer and the Greek night in the Taverna by the beach was much better than the hotel version, lovely staff who did not mind you just popping in for a drink. The rooms are suposed to have been upgraded several months ago and although clean and nicely decorated several advertised features are a problem. the room key turns off all electricity, so you have to get another to keep it on. Even then the airconditioning although free struggles to keep the room cool, the fridge will only ever get water tepid and the TV was a joke, they never could get it to work. They had a nice pool that was kept clean but at peak season there was not enough room or sunbeds around it unless you are prepared to play the towel game. We found the food very good, especially with two children a good variety and it ever ran out. However it was far from peaceful, in this inside restauraunt the shear number of people made it very noisy and hence not relaxing. Holiday did not start to well as when we arrived to check in they said we were booked with jmc and had booked half board. We politely informed the hotel reception manager that we were in fact with Thomas Cook and all inclusive. We had to get out the papers to show them before they would believe it. I also showed them that we had also booked a sea view room. We were placed in a room with a side sea view. They had no other room available. Complained to the rep next morning, she said she had not got us down for a sea view!!! She checked and found we were not lying! We went all-inclusive for two weeks and usually by the end of week one we're fed up with the food - but not here. They offered a good selection of hot and cold meals with the chef cooking a couple of different dishes freshly at breakfast and dinner times. One critism was that the food down in in pool bar at lunch time wasn't kept particularly hot. The location wasn't really to our liking as we like to have a stroll in the evenings, this hotel was further out of the town than we thought. There was, however, a good sea view as the hotel is placed up hill. We discovered that perhaps Zante has the poorest beaches we seen so far in Greece. The hotel staff were excellent - particularly Lefteris and Dennis in the bar. - Manager take note - these two members of your staff are assets, please appreciate them! Dennis is off to do his army service in October, so we wish him all the best in that. Entertainment - well, what can I say. It was very regular throughout the day. The staff did their very best to get you to join in. Rocco even told you when to applaud (which was every 30 seconds). Many of the evening shows were down on the lower stage where there isn't a bar so we didn't tend to go to those, so I can't really comment on the quality.